AED Wall Sign At A Competitive Price - Order One At Real Response! Sudden cardiac arrest kills between 15,00-20,00- Australians a year and is our leading killer. Early response is critical for the victim’s survival. With clear signage for your defibrillator you can be sure that anyone can access your unit at anytime. 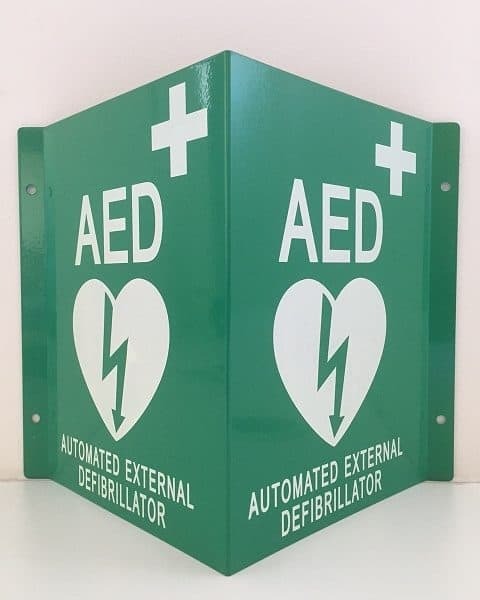 green with clear white print, this sign can be seen from a distance and will make your defibrillator location stand out for anyone to see. Make the most of your investment and alert people to you defibrillator, it could save a life! A defibrillator or AED is a portable unit which measures the electrical activity of the heart and delivers defibrillation therapy according to what sort of malfunction the heart muscle is experiencing. This could be be ventricular tachycardia (rapid rhythms) or ventricular fibrillation (chaotic rhythms) or both. This abnormal heart beat is what stops the heart pumping blood through the body to the vital organs. Instead of beating the heart quivers, without enough force to circulate blood. If you have purchased a defibrillator you know that this unit is able to jolt the heart back to a normal rhythm and thus, prevent the brain (and subsequently the body) from dying. But did you know how crucial quick intervention is? A victim of sudden cardiac arrest has 4-6 minutes before their brain begins to die and a limited amount of time following that for their life to be saved. There is only a 2%-5% chance of survival for cardiac arrest victims in Australia, and a lot of that has to do with delayed medical attention. Bystanders tend to wait for an ambulance, and with wait times being 10-12 minutes even in major cities, critical time is lost. By purchasing a defibrillator you have taken the first step to ensuring that adequate support is given to someone who has just suffered a sudden cardiac arrest. The next is adequate signage for your defibrillator. The location and signage for your defibrillator will ensure that the defibrillation link in the Chain of Survival for sudden cardiac arrest will be fulfilled. The Chain of Survival is the list of sequential events that must occur in order to increase the victim’s chances of survival. It involves: – early access to medical help – early CPR – early defibrillation – early advanced care In times of stress people panic, preventing them from thinking clearly and being at their most effective. It is crucial that anyone can gain access to your defibrillator at any time to provide treatment to a sudden cardiac arrest patient. Signage for defibrillators should be placed above the unit and in a clear space. The defibrillator should be easily accessible from high risk areas such as sporting complexes, a brisk 60-90 second walk from any part of an establishment should be the maximum sourcing time for such critical equipment. The nature of sudden cardiac arrest is such that most people will not have warning that they are about to suffer an attack. They will often exhibit no signs of illness apart from the immediate collapse and loss of consciousness associated with sudden cardiac arrest. This means that an incident could occur at any place and at any time. Your defibrillator and sign should always be accessible and make it easy for people not familiar with your location to identify and gain access to the unit.